jagger recipes. Gur sweet recipes. Sugarcane is crushed to extract juice and then the juice is strained and boiled for few hours. This concentrated liquid is added into moulds and kept to cool off till it hardens to form Jaggery or Gur. The color ranges from golden yellow to dark brown. It can even be extracted from palm sugar or date palm. These days sugar has been used extensively used which is a refined, crystallized form of jaggery. They both are alternatively used as sweetener in Indian cuisine. Jaggery has a number of health benefits like it helps in digestion and improves blood circulation. It is a rich source of iron and vitamin C, it helps relieve cold and cough, boosts energy and immunity. Additionally, gur is known to have properties that keep your body warm, hence it is widely consumed during winters. Makar Sankranti is a Hindu harvest festival celebrated all over India in different forms. In southern India it is celebrated as Pongal, Bihu in Assam, Lohri in Punjab, Poush Sangkranti in West Bengal, Maghi in Himachal Pradesh. People in Gujarat fly kites in the beautiful sky and relish saat dhaan khichri and undhiyu. Maharashtrians exchange laddu and greet , "Til, gud ghya ni god god bola" which means Eat Til and Gur and speak well. Families prepare different delicacies like Til Papdi chikki, peanut chikki, Kurmura chikki, Til and dryfruit chikki, sweet pongal. Indian festivals or any other occasions are incomplete without sweets and also, we have a big sweettooth for desserts post meals. Jaggery has always been used to make a number of traditional desserts like Gur Chawal , Puran poli, Moong Dal Payasam, Modak, Gulgule. Gujarati's love to add a touch of sweetness to their food. Jaggery balances the salty, sour and spicy flavors of the dish. Try these Gujarati Dal, Dal Dhokli , Toovar Dal, Lachko Dal , Fajeto to tantalize your tastebuds! Jaggery is also used to make a variety of chutneys, which acts as an accompaniment that never fails our tastebuds. Blend some simple ingredients along with jaggery to create a medley of flavours. Ginger chutney, Coriander chutney, Mysore chutney, Malgapodi, Khajur Imli ki chutney pairs well with appetizers. 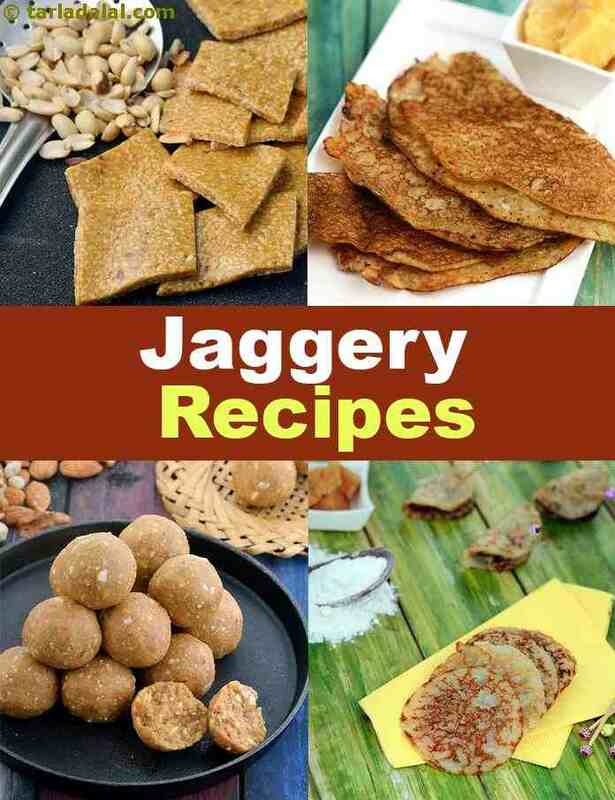 Enjoy our collection of Jaggery recipes and Jaggery Sweet recipes below.